Exceptional build quality, feels solid and works impeccably. Quite expensive - worth every penny though. 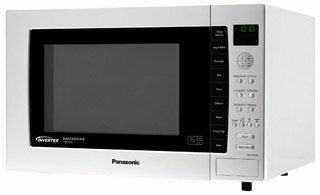 The NN-CT857WBPQ from Panasonic is a high end combination microwave, with a massive capacity, exceptional power output and decent build quality. Essentially it's aimed at those who are after a well manufactured large and powerful microwave, with a host of features. Total capacity is 32 litres, which is around double that of most entry level microwaves. Along with the 1000w microwave output, it also includes a 1500w grill, with 3 different settings. In addition to those, the convection oven provides a temperature range of 100-250C, and no less than 16 Auto sensor reheat / cook programmes included. Inside you'll find a 34cm turntable, which fitted even the largest dishes we could find - we're confident this will accommodate all of your plates and containers. Overall weight is around 20 kg - so fairly heavy - mainly due to the size and silver stainless steel exterior. The NN-CT857WBPQ is simply a stunning, functional yet reliable combi microwave, which is incredibly well constructed, easy to use, and offers a large capacity. It will end up replacing most of your other kitchen appliances, it's that versatile! Our testers loved it. If you're looking for a large capacity combination microwave, then you could do a lot worse than to buy the NN-CT857WBPQ. 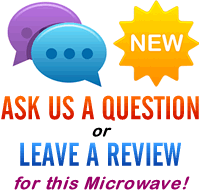 This Panasonic microwave works very well, and should last for years.